I recommend this turntable if you don’t want an advanced and complicated turntable. The ION LP is easy to use and the cost will be about $100. While not intended for audiophiles or Hi-Fi enthusiasts, this turntable is a great option for the average LP listener. With the push of a button you can pair the ION Air LP to your Bluethood speaker. 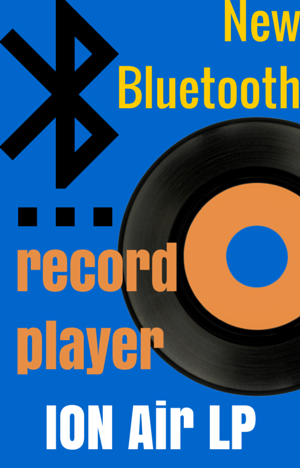 The turntable will connect to the closest Bluethood speaker neer it. This product also comes with a USB port that allows you connect the player to a computer. You can use the ION Audio software, EZ Vinyl/Tape, Converter for easily digitizing your music. This unit also has RCA line-level outputs, so you can connect it to a pair of powered speakers, to a sound system, receiver or aplifier. Just be careful, this turtable cannot be connected to a PHONO level input. A plus feature that may come in handy is the auxiliary input that allows you to connect a CD player, MP3 player, or other audio source. The ION Air LP has a fixed tonearm with a ceramic cartridge. Unfortunately, the cartridge cannot be upgraded and the turntable doesn’t have adjustment features like counterweight and anti-skate. This unit supports playback speeds of 33&frac13;, 45 and 78 rpm. However, a special stylus iCT06rs is needed to play 78 rpm records. It has an auto-stop feature that prevents the platter from rotating for ever when it gets to the end of the record. You still have to manually return the tonearm to its rest. The ION Air LP wireless record player will soon be available. It’s a great choice for people needing an easy to use wireless turntable. If you are looking for a turtalbe with speakers, you may consider buying the ION Air LP bundled with Bluethooth speakesr. Thanks for stoping buy. I hope you liked my article. Please leave a message, I love hearing from my readers. * Using the Bose Mini Soundlink as my bluetooth source, the sound from ANY LP I played was muffled and often emitted “cracking” sounds. * Pairing was easy,but the Bluetooth connection would intermittenly “cut-out” more often than not. Speaker was placed less than 3 feet away, so distance was not a factor. I wasn’t expecting much for $99, but the Bluetooth feature was a complete failure. Thank you very much for your input. Your comment will help other readers. I didn’t know, this turntable was already available at Walmart. I was looking forward to this turntable because of its Bluethooth connection. Too bad it disappointed your.